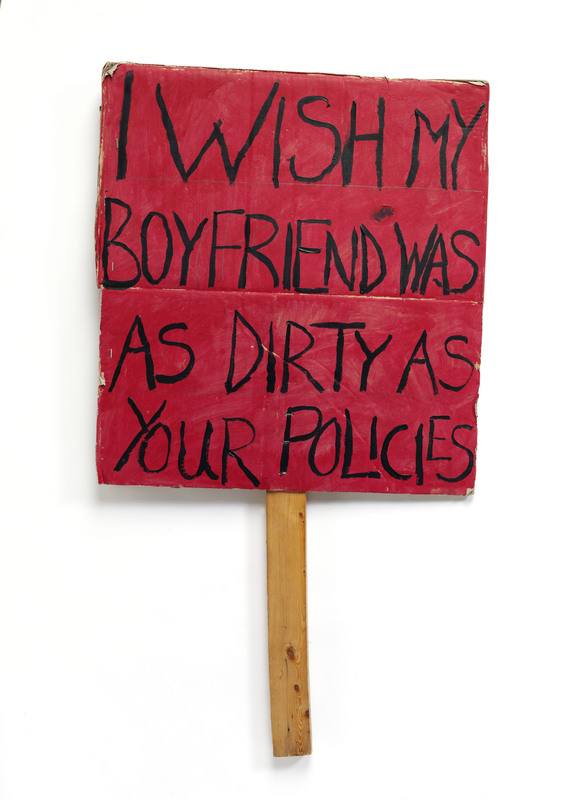 A timely new exhibition at the V&A, Disobedient Objects, casts light on the role of objects in social protest. The result is a poignant – yet surprisingly optimistic – celebration of art and design from below. At first glance, Artur van Balen’s ‘cobblestones’ do not resemble objects of social protest. 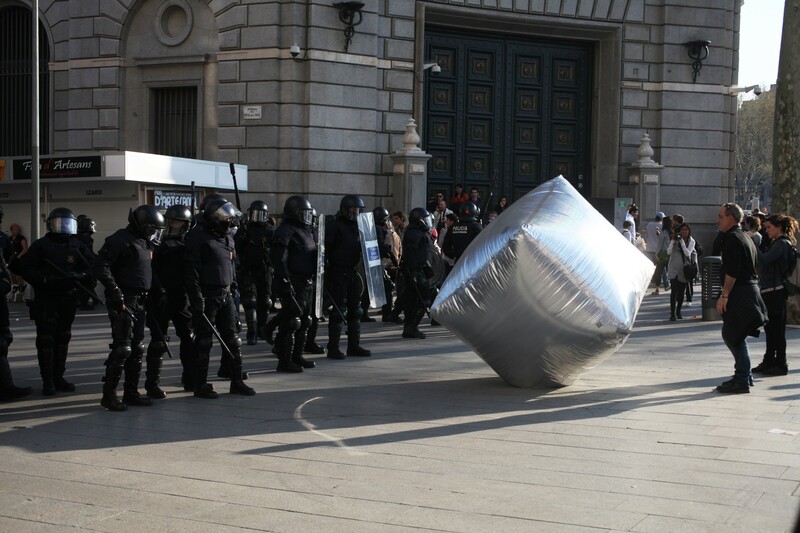 These huge silver inflatables look less like actual cobblestones, and more like something you might find in a children’s soft play area; altogether too bouncy and innocuous to be capable of enraging the riot police. And yet the cobblestones featured prominently in the 2012 May Day demonstrations. Produced by Balen and other members of the Eclectic Electric Collective, they were intended to subvert the reputation of protestors as stone-throwing troublemakers. Video footage shows a cobblestone bobbing high above the crowd, like a beach ball or celebratory balloon. In Berlin, armed police officers tried unsuccessfully to pierce one; in Barcelona, they arrested one and bundled it into a van. Balen has called the cobblestone ‘a secret weapon of tactical frivolity’, in that it serves a protective function for protestors while introducing an element of farce. Something similar applies to the ‘book bloc shields’ that have been used in student protests since 2010. Decorated like book covers, the shields are used to defend against baton strikes, cleverly turning any skirmish into a literal attack on ideas. In both cases, police brutality is exposed not just as unwarranted, but as downright ridiculous. The stones and shields are on display at the V&A’s new exhibition, Disobedient Objects, which is devoted to objects that have played a role in social change from the 1970s to the present day. Also on show are a saucepan lid, a gorilla mask, Polish dwarf hats, a ‘Capitalism is Crisis’ banner and a ‘Tiki Love Truck’, to name a few. The issues at stake range from the death penalty to the underrepresentation of women in US galleries. It’s an eclectic mix, but then ‘disobedient objects’ is less a theme than it is a whole conurbation of ideas. It covers not just the physical tools of protest, but also the role of objects in solidarity and the dangerous power of visual emblems. Despite being relatively small, this is an exhibition to savour slowly; dense with content and rich with stories almost to the point of surfeit. At its most basic, Disobedient Objects is a celebration of art and design from below. The designers, as co-curator Gavin Grindon explains, worked by any media necessary using limited resources, often while under duress or outright attack. Given that they were directly challenging the powers that be, it’s unlikely that any of them expected their work to end up in a museum – tear gas masks and lock-on devices being some way removed from the cosy elitism of ‘art for art’s sake’. Perhaps as a result, the exhibition feels unusually urgent and engaging. Many of the conflicts represented are still current: as is clear from an enthralling data visualisation, the number of protests around the world has increased dramatically since 1979. Plenty of the objects have a rawness to them not commonly associated with glass cases. One of the first exhibits, a suffragette cup and saucer, makes for a telling counterpoint. This once threatening object now reads as almost twee; a world removed from the Syrian puppet shows or the defaced currency that more properly set the tone for the exhibition. It invites us to ask: to what extent can time and certainty distance us from a conflict, rendering its memorabilia comfortable? Some of the objects are deeply moving, irrespective of how much time has passed. Particularly poignant are the Chilean arpilleras, woven folk art dating from the Pinochet regime. While these seem, on first blush, like typical embroidered textiles, the colourful stitching comes with a darker subtext. For instance, ‘Donde estan nuestros hijos’ (‘where are our children’) depicts a crying woman and manacled hands. It was created by the mother of one of the ‘desparecidos’ – an opponent of the regime who had vanished and been murdered for his dissent. On the back is a secret pocket containing a note: ‘This represents our children under the eye of the DINA [political police service]’. 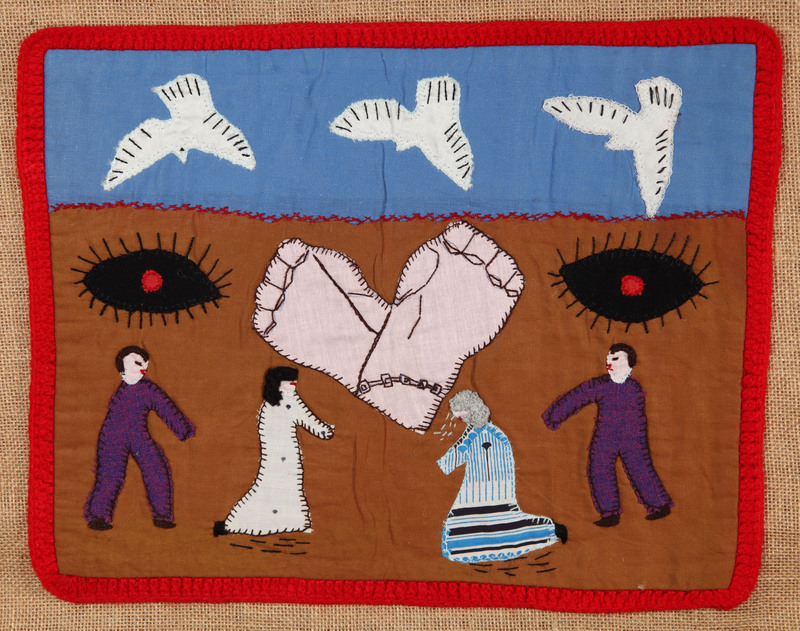 These textiles were created in communal workshops, which were intended to provide the women with strength and solace: they said that when their hands were engaged in sewing, they finally felt safe enough to break their silence. Amazingly, the arpilleras passed under the radar of the authorities and were frequently sold on to solidarity movements abroad. Not all the exhibits are quite so personal or highly crafted. The curators also want us to think about the role of the replicable – logos, posters and badges – in strengthening a movement or disseminating ideas. We see, for instance, a display of anti-apartheid badges, mapping how the sentiment spread from South Africa to sympathisers around the world. Next to it are T-shirts stamped with the logo to an AIDS advocacy group. While the contentiousness of such causes has long since receded, some of the symbolism on show is still politically charged. Take the placard created in 2012 by gay rights activists standing against Putin. This was the first time the LGBT flag had been displayed in public in Russia and, as co-curator Catherine Flood points out, “it represented an incredibly important moment in speaking out”. By and large, this is design taken out the hands of the designers, prioritising the collective over the individual. Many of the objects are intended to be easily recreated, such as the ‘Flone’, which has been used to record police movements in several protests. A propeller-powered H-frame, the device is ingenious in its simplicity – insert your phone and there you have your very own home-made drone. Instructions on how to make the device have been spread online, and the V&A too has entered gamely into the spirit of open sourcing. Visitors can take home a selection of guides, detailing how to build their own Flone, tear gas mask or book bloc shield. And while there is admittedly something incongruous in all of this – the V&A is not the first place you’d come for your drone-making needs – the sheer audacity behind the gesture is surely to be admired. The curators, after all, are working from a tricky position. No matter how sympathetic they are to their causes, the fact remains that this is a polite Victorian building in well-heeled South Kensington, named in honour of a queen. Within this context, there will always be something jarring about challenging neoliberalism or speaking out too vocally against the status quo. On the other hand, the exhibition might lack some of its subtlety if held in a more apropos venue. Part of the point is to show how dissidence over the years has shaped our sense of normal, and how the most mundane tenets of our society were once deeply radical propositions. Back to that suffragette teacup – as journalist Laurie Penny explains in an accompanying film, the suffragettes were once seen as terrorists. Are activists the engineers of the future establishment? There’s more than a whiff of that suggestion here. Still, however you parse it, it’s hard to deny that Disobedient Objects has come at a perfect time. The last few years have seen the Occupy movement, the Arab spring and most recently the Gaza demonstrations, giving the lie to the idea that the 1960s were the golden age for dissent. Grindon and Flood do a great job of capturing the dynamism of protest: at the moment there are 99 objects, but there’s a blank space for a hundredth to be filled before the exhibition ends. Despite tackling some difficult ground, this makes for a curiously optimistic few hours. Brightly coloured and vibrant – the banners and placards leaping out against the pared back Porter Gallery – it pays testament to what is possible even in the face of tragedy. Chanting and drum beats stir a sense of primal energy, with rousing video footage inviting new ways of contextualising what we see. Design is often discussed, in hyperbolic terms, as having the power to change the world, and perhaps in the case of some of the objects here that isn’t too great an exaggeration. All in all, the exhibition tells a compelling and cohesive story about resourcefulness in the face of injustice. This is what can happen when ordinary people break the rules and take design into their own hands.